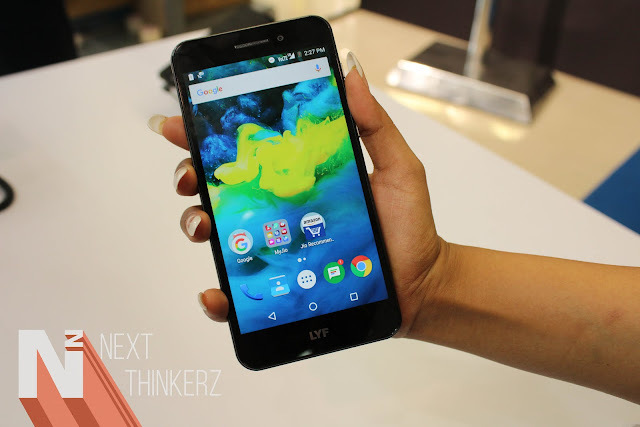 LYF Water F1 Launched: Specifications, Price, and Availability. Reliance Retail is a brand which has been highly known in Indian Market for their LYF Brand, Ever so likely due to the JIO SIM that comes bundled along with it. Water, Fire, and Earth are the strong holdings that resemble the LYF Brand in terms accompanying several models. So selecting the Water tag from all those external tags today, Reliance Retail introduced LYF Water F1 under the "Special Edition Device Tag" from LYF Smartphone +. We attended the F1 launch event and here's everything you need to know about the new LYF Water F1 Smartphone+. It comes with a Qualcomm's Snapdragon 617 MSM8952 Octacore processor which is a 64-bit CPU, coupled with 3GB RAM. Whereas there isn't any official word on the GPU. It comes with a 5.5 inch(Full HD) IPS LCD Display giving it an overall pixel density of 400ppi. Whereas they've incorporated Corning Gorilla Glass 4 for protection. It has a 32GB Internal Storage and expansion is available up to 128GB via a MicroSD Memory Card slot. It has a 16MP rear camera with phase detection autofocus system, EIS, and a multi-focus mode, Whereas it records in 1080p HD at 30fps. When it comes on the front, It has an 8MP Camera with an Autofocus sensor; This has to be the first device I've seen with this feature. Apart from the usual sensors - Gyroscope, Ambient Light. Accelerometer, Proximity, etc. It comes with Bluetooth 4.1, WiFi 802.11 b/g/n & Dual SIM 4G LTE Advanced connectivity. It has a 3200 mAh Non-Removable battery. While it runs on Android Marshmallow 6.0.1 with LYF's suite of apps. So instead of emphasizing on the specs, Reliance Retail mostly focused on the connectivity part on this device. The LYF F1 is more so likely focused on their next big step in the VoLTE journey or the JIO Ecosystem Since most of us got to know about this feature due to them. So the officials present at the event said that with LYF F1, They're introducing 4G LTE Advanced which comes with Carrier Aggregation support. This carrier aggregation supports all 4G Bands and can achieve almost twice the speeds that you were already receiving on JIO 4G Network. Reliance Retail claims it to be the World's Largest all IP supported Network. 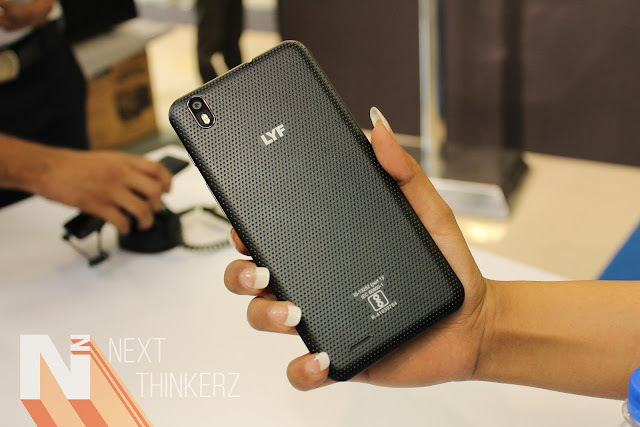 So expect an increase in the speeds of Data Reception on this LYF F1 Smartphone. Share Map - While attending a Call, You can send a request to your Friend with a single tap without leaving the phone dialer and Once your friend accepts this invite, Then you can place a line, an arrow or anything and let your friend know about your location. On the other hand, You can see your friend's location while everything you draw gets received by your friend on his phone in real-time. This thing is sick, Trust me. Share Sketch - This might get called as a funny little feature, Ever so likely for the "Couples" out in the wild. Tapping on the Show Sketch option opens up a blank page where you can send any text or Play X & 0's while getting into that aura of a Call conservation. This might also amp up relationships with Sorry and Miss You, Texts. Evolved Messaging Features - This feature lets you send and receive texts while attending a call, Which is quite useful. Consider participating in a call and getting that much-needed document at the same time, How cool is that?. Whereas on the software forefront, Reliance Retail is introducing a split screen like feature which lets you play two videos simultaneously, This gets tagged as Smart Play. Whereas there's also the addition of intelligent display which essentially means that Proximity sensor performs its role in pausing the video, when you look away from the screen. Both these features are nicely implemented and work as they should, Since I tested it at the event. Another sweet little feature is the implementation of the "Smart Ring technology." This is embedded as a standalone App where the company has introduced Lots of features such as tracing your smartphone in silent mode, Amping up the audio game in loud environments whereas damping down the sound in quite situations, Which is surprisingly interesting. You can even set the ringtones and alarms to be on low sounds for specific times So that you won't give up on those beautiful dreams in the night. So the LYF Water F1 is priced at Rs.13,399 which is an attractive mid-range pricing, Considering the features such as 4G LTE Advance, RCS(Rich Communication Services), Smart Ring Technology, It seems like a good buy. All of that bundled with JIO's Welcome Offer consisting of all the glory of value added services is a nice touch. Connectivity is it's ultimate selling point. So the LYF Water F1 is available across all the Reliance Digital Stores starting today. You can head over to the nearest Reliance Digital Stores or Xpress Mini stores to get a glance of the services mentioned above on the LYF Water F1. Whereas regarding the Online availability is yet to be confirmed. JIO has been an overall selling point for Reliance's devices sold in the past, But now the implementation of their network connectivity with a solid amount of services including the RCS seems like a good step in a helpful direction. It's Always good to see companies innovating something, Rather than blatantly throwing specs regarding numbers and not heading into the way of optimization like most competitors. So let's see how well, the LYF Water F1 performs, I look forward to it. Whereas what are your thoughts about this device? Do let us know in the comments section below.